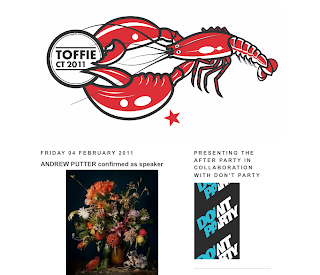 The second Toffie Festival, hosted by The President design studio, will be held 24-26 March 2011 at the Cape Town City Hall. It offers South African and international pop culture packed into presentations, exhibitions, workshops and social events. The President's creative director, Peet Pienaar, says its interactive platform sets it apart from other pop culture and design festivals. "Participants are given an opportunity to forge connections with top creatives in their fields, with all workshops and presentations are designed around this principle. We aim to create a festival that is not intimidating and affordable. Day one offers exhibitions by some of South Africa's most exciting creatives, curated by The President. Other players include What if the World, Marcii Goose, Richard de Jager and Word of Art. Spanish designer Alex Trochut (www.alextrochut.com), grandson of 1940s typographer Juan Trochut, is known for his commercial and editorial work on the world's most famous superbrands, including Cadbury, Universal Records (for the Rolling Stones), Adidas, Nike, British Airways, The Economist, Wired and Channel 4. Argentinean filmmaker, Javier Lourenco from Flamboyant Paradise (www.flamboyantparadise.com/site) who has received over 100 awards and whose short film, "The Blindness of the Woods", was officially selected for the Sundance Film Festival in 2009. At the social gatherings, The President will also announce the winner of the R10 000 Jay Jays/MK Bruce Lee design awards. Tickets are R750 for professionals and R500 for students which cover all activities and can be booked at toffie@thepresident.co.za. For more information, go to the blog at www.toffie.co.za.